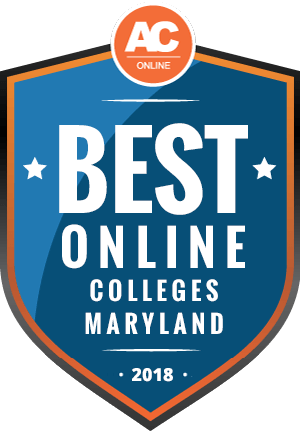 Why Choose Maryland for Online Higher Education? Maryland’s 4.1% unemployment rate (as of October 2018) underscores the need for skilled workers in the many industries driving the economy. A report by the Georgetown Center on Education and the Workforce projects that 69% of the state’s jobs will require postsecondary education by 2020: 29% will require some college education such as an associate degree, 23% will need a bachelor’s, and 16% will require a master’s or more. Maryland’s data shows that almost 40% of the state’s residents hold at least a bachelor’s degree, making it the third-most educated populace in the nation. Whether you live in- or out-of-state, Maryland provides you with the opportunity to earn a degree from an excellent education system. This resource outlines the state’s employment needs and several benefits of attending affordable online colleges in Maryland. Online colleges in Maryland serve diverse populations with flexible educational opportunities that help learners update or acquire new skills. Flexibility serves as the main allure of virtual classrooms, which provide single parents, full-time workers, underserved populations, and laid-off employees with the opportunity to earn online degrees while juggling multiple obligations. Maryland residents qualify for in-state tuition that costs much less than tuition for out-of-state students. This general rule also applies to online learners: An increasing number of online schools charge online students in-state tuition, regardless of state of residence. Furthermore, many states belong to one of several regional interstate compacts, including the Southern Regional Education Board, to which Maryland belongs. These compacts give residents in member states access to in-state tuition because of their reciprocity agreements. For some schools, to qualify for in-state tuition, students must demonstrate 12 consecutive months of residency in Maryland. The average cost of out-of-state tuition in Maryland is a few thousand dollars lower than the national average, which is $24,854. The national averages for in-state and out-of-state tuition for public two-year institutions stand at $3,156 and $7,668, respectively — both cheaper than Maryland’s. Online learning saves students money because they do not pay for room and board, transportation, and other related costs such as childcare. Online schools only charge tuition and fees, which vary depending on the program, and some schools charge only tuition and no additional fees. The following lists a sampling of schools in Maryland and their undergraduate tuition rates. If you’re considering attending an online college in Maryland and you don’t live in the state, determine if your state belongs to a regional interstate agreement that gives tuition discounts to students in neighboring states. This saves online learners money on Maryland’s out-of-state tuition, which stands at $3,635 for undergraduate and $9,400 for graduate students, according to NCES Integrated Postsecondary Education Data System data. Learners should also determine if their state belongs to the National Council for State Authorization Reciprocity Agreements (SARA), which oversees the delivery of postsecondary online education, including attendance restrictions. Maryland belongs to the Southern Regional Education Board (SREB) regional compact, comprised of 15 states in the south, including Alabama, Florida, Virginia, and the Carolinas. Students living in one of the SREB states benefit from tuition discounts for more than 1,900 programs in SREB’s Academic Common Market. Learners must select a program in Maryland that’s open to distance learners in their state and complete the admissions process. Upon approval, which requires certification of residency in the SREB state, learners pay in-state tuition and save thousands of dollars. The SARA gives Maryland colleges approval to offer distance learning to residents living in member states. Colleges must meet certain established criteria in order to participate in SARA. The agreement ensures the quality of programs offered and provides consumer protections to distance learners in both undergraduate and graduate programs. This ranking of Maryland’s top affordable online colleges considers a number of factors, such as accreditation and breadth of online programs available at both two-year and four-year institutions. To make the list, schools must provide value with in-state tuition below $5,000 for two-year schools and below $25,000 in-state tuition for four-year colleges. The schools’ total scores also reflect performance regarding other criteria such as graduation rates, financial aid available, and services such as academic and career counseling. The following resources provide answers to some commonly asked questions about attending Maryland’s online schools. Review the list to help you choose a program from the best online programs in the state. Do online credits cost more or less in Maryland? Students who attend online colleges in Maryland often pay less tuition than their on-campus peers. Maryland’s on-campus tuition represents a mixed bag compared to national averages, with Maryland’s in-state tuition costing a bit more than the national average, and the national average for out-of-state tuition more expensive than Maryland’s. However, these figures include room and board, which significantly increases the cost of attendance. Furthermore, each school establishes the per-credit cost of tuition, and it may even vary depending on the program. Learners should carefully review tuition information as they try to find the cheapest online colleges. Which Maryland schools accept the most transfer credits? Many postsecondary students begin their education at one institution and transfer to another. Whether they live in Maryland or elsewhere, many students opt to complete the first two years of colleges at a junior college and then transfer to a four-year institution to save money. Others transfer between four-year institutions because they relocated or changed their program of study. The state does establish some guidelines for transfer for all colleges. One of them is that learners who complete an associate degree at Maryland’s community colleges — or a minimum of 56 credits, with a minimum cumulative 2.0 GPA — receive direct transfer to the state’s public four-year institutions. Another guideline requires that learners transferring from an associate degree-granting institution can transfer no more than half the requirements for a bachelor’s degree, not to exceed 70 credits. The Articulation System for Maryland for Maryland Colleges and Universities (ARTSYS), overseen by the University System of Maryland, helps learners facilitate a smooth transfer from out-of-state schools or between Maryland’s colleges. A computerized system, ARTSYS provides a method to determine if courses transfer to the intended transfer institution. Students simply enter transcripts into ARTSYS for one program at an institution or several programs at multiple institutions. Will any online colleges in Maryland accept a GED? The General Educational Development (GED) serves as a high school equivalency exam that demonstrates learners’ competencies in general education subjects: math, language arts, science, and social science. Learners use the GED to gain entry into undergraduate programs at any of Maryland’s two-year online colleges, such as Baltimore City Community College, Hagerstown Community College, and Prince George’s Community Colleges. All three schools offer several online programs. But applicants may also need to pass a placement test such as ACCUPLACER and meet other requirements for admission to two-year colleges. Four-year colleges will likely also require SAT or ACT scores for general admission, and additional requirements depending on the specific program of study. First-year applicants with a GED may also use AP, IB, and CLEP scores to bolster their application and receive credit toward a four-year degree. How many academic terms per year do online colleges in Maryland offer? The University of Maryland, University College serves as one college that offers multiple start dates per term. Every institution determines start dates for programs, and this may vary from program to program within institutions. Many online programs follow the same start terms as the traditional campus, enrolling students in the fall, spring, and summer. Others may feature multiple start terms per year, including monthly starts. Students should consult the admissions department for the school they wish to attend in order to determine the start dates for online universities and the materials needed for application. Students can access the admissions department from the main page on every school’s website. Applicants should also look at the program website to which they want to apply to view start date information. Which online colleges will accept FAFSA in Maryland? Any college in Maryland that awards federal financial aid must require that applicants complete the Free Application for Federal Student Aid (FAFSA). It does not matter if the school serves learners with online or on-campus programs. FAFSA determines student eligibility for federal financial aid, but it is also used to calculate Maryland state financial aid and institutional financial aid. Applicants need to check in with all the colleges they are considering to determine financial aid requirements and deadlines. The Maryland Higher Education Commission, which determines eligibility for financial aid, provides detailed information about applying for financial aid on the commission’s website. Learners should also make sure the online school they plan to attend holds accreditation from the Middle States Commission on Higher Education, a regionally accredited agency that approves colleges in Maryland and surrounding states. Students must attend regionally accredited online colleges to qualify for federal financial aid. Are there any free online classes I can take from Maryland colleges? The University System of Maryland offers free online classes in partnership with participating schools and edX, a virtual college and massive open online courses provider whose aims to increase access to high-quality higher education, advance research, and foster a culture of entrepreneurship and innovation. USMx provides free online courses in a variety of subjects, including software testing fundamentals, instructional design, leadership and influence, and financial accounting. Students need to register online to create an account and sign up for the course they want to take. The courses start at different times, and most courses require self-paced learning to give learners maximum flexibility. Once students complete the program, they may choose to receive a certificate of completion for a small fee. Other schools, such as Johns Hopkins University and the University of Maryland, College Park, offer free or affordable online courses through a partnership with Coursera. Learners should visit Coursera’s website to examine the extensive catalog of offerings and institutions that provide them. Learners should also contact other affordable online universities in Maryland to see if they offer any free courses. How can I find the online program options at Maryland’s colleges? Founded 70 years ago to serve adult learners and servicemembers, the University of Maryland, University College, a member of the University System of Maryland, offers the most extensive catalog of online degrees in the state. The online state university offers 90 online programs, certificates, and specializations at the baccalaureate and master’s levels. Students receive great benefits such as affordable tuition, no-cost digital course materials for nearly all courses, and the option to attend classes in person at locations in Maryland and at military installations. UMUC, also the largest online public college in the nation, provides a streamlined admissions process that requires no SAT or GRE, and offers multiple start dates for great flexibility. Online learners may also consult the University System of Maryland website to learn more about the system and access links to individual member colleges to find information about online programs. Learners who plan to pay for their education with some form of financial aid should first look at the Pell Grants program administered by the U.S. Department of Education. Unlike a loan, the grant does not need repayment. The program takes into account the cost of attendance, as well as the applicant’s financial need, full- or part-time status, and completion plans. For those ineligible for the grant, the following lists five scholarships specifically for schools in Maryland. Maryland sponsors this scholarship for learners in the state who demonstrate need and plan to pursue postsecondary education in any major. The program welcomes high school seniors or undergraduate and graduate students attending a public or private college in Maryland either full or part time. Applicants must contact their delegate in the state as part of the application process. The GA grant provides postsecondary assistance to high school seniors or GED holders under the age 26. Applicants must demonstrate eligibility for in-state tuition, demonstrate need, and hold a minimum 2.5 GPA or score a minimum of 165 in each module of the GED. The grant funds full-time education at two- or four-year colleges or universities in Maryland. AFCEA Washington provides 12 scholarships to STEM majors who live within the Metropolitan Washington Council of Governments (which includes the Maryland and Virginia legislatures). Residents within Maryland must be high school seniors or a second-year students attending a community college who have been accepted to a four-year college. Maryland students pursuing graduate or professional studies can apply to this grant program awarded to students who demonstrate sufficient need and who plan to pursue a degree at specific colleges in Maryland. Applicants will need to contact the school they plan to attend to be considered for this grant. The Presbyterian Church offers need-based scholarships to church members attending accredited institutions in any state in the U.S. Applicants must attend school full time as sophomores, juniors, or seniors with a minimum 2.5 GPA.